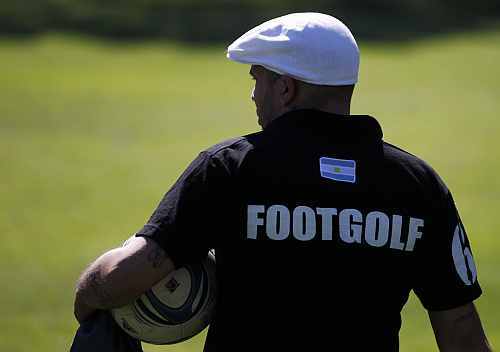 The innovative fusion sport of football-golf is helping Argentine courses stay afloat in testing economic times when golfing revenue alone is often not enough to cover costly maintenance fees. The game was played in Argentina for the first time two years ago and it is beginning to make waves right across Latin America. Jose Luis Chilavert, who played in goal for Paraguay at the 1998 World Cup and was renowned for scoring penalties and free kicks, and former Boca Juniors forward Walter Pico are two high-profile footballers to have tried their hand at the fusion sport. 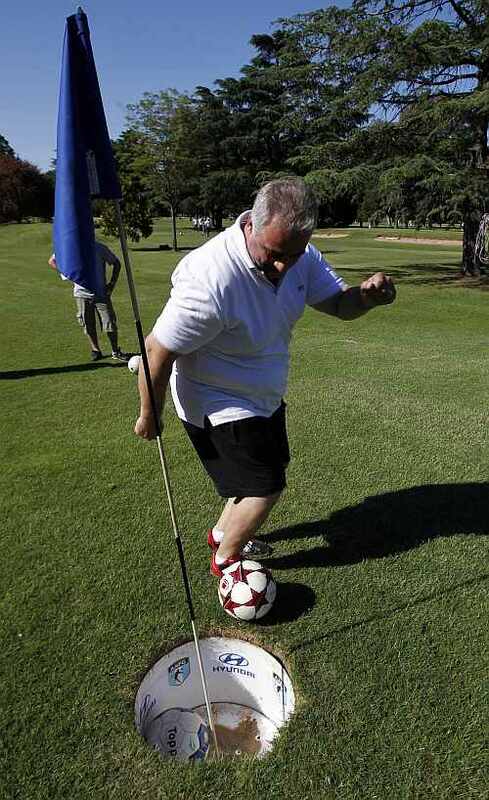 Argentine Football Golf Association president Javier Ancizar told Reuters in an interview the new pastime was not a rival to traditional golf. "We want to add something positive, not to compete (with golf)," said Ancizar who schedules tournaments in midweek when fewer golfers play. "We're aware that we are on golf grounds but at the same time there are many courses in Argentina that may not be able to do all the necessary maintenance with just golf revenue alone. "I see this as a good way for golf courses to supplement their earnings and help with course upkeep," added Ancizar. While the origins of the fusion sport are unclear, the International Football Golf Association was founded in 2009 by Dutch footballer Michael Jansen. Jansen's home country hosted a soccer-golf championship in September of that year and it sparked interest around the globe. The inaugural World Cup was held this year and featured 80 players from eight different countries. The game's objective, like golf, is to get the regulation size-five football in the targeted hole in as few kicks as possible. Although competitors use traditional golf courses they do not walk on the putting surfaces, instead the wider holes are dug out around three metres from the greens and are filled in with sand and covered with a tuft of grass after tournaments. Tees and fairways are set up to one side in order that the grass on the golf courses is not damaged. "You don't have to be a good soccer or golf player, you just need to know how to kick the ball and know how to think - to analyse the course so as to not take unnecessary risks," said Ancizar. 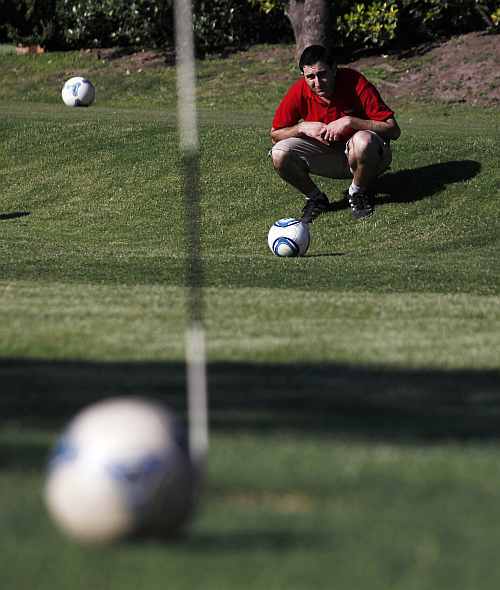 He believes the day when golfers and soccer-golfers can share the course is a long way off. "We haven't had a time when we were playing simultaneously. When we do these kinds of events they close off the grounds for our use only," said Ancizar. "In reality it's strange that they co-exist. If a golfer gets hit by a football it wouldn't bother him too much but if a soccer-golfer gets hit by a golf ball problems could arise." Since the only necessary piece of equipment is a football, it is a widely accessible pastime. "Anyone can kick a football. It's a sport for everybody, kids, older people, girls," said Ancizar. 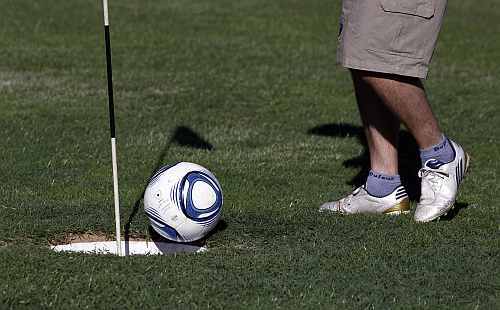 Soccer-golf appeals to former footballers as it puts a new twist on traditional skills while at the same time cutting down on the risk of injury. "There are a lot of ex-footballers who see this as a good way to broaden their range of athletic activities," said Ancizar.